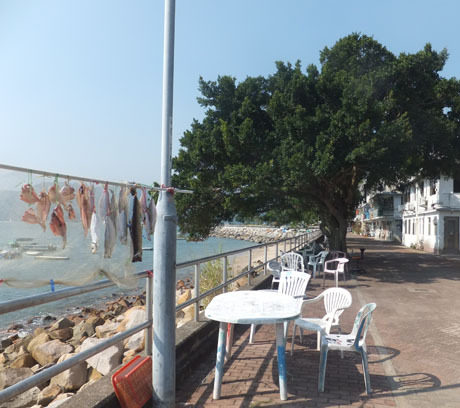 Peng Chau is a tiny island situated 8km west of south Hong Kong Island and a short distance from the southern coastline of Lantau Island. Around 6,300 people live on the island which being only around 1000 metres long is densely populated. 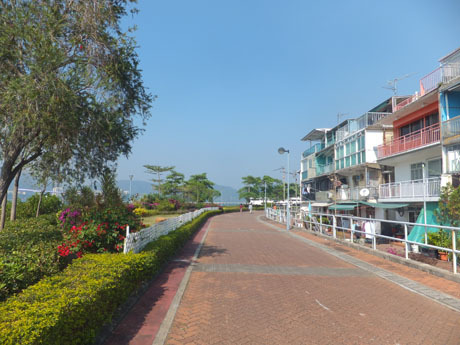 It is almost resembles a miniature version of its neighbour Cheung Chau, and although something of a rural retreat today, it has an interesting history and was once a thriving industrial island which, in its 1960's heydays, had over 100 factories serving over 30 industries. GETTING THERE – Peng Chau is served by ferries from Central Pier 6 on Hong Kong Island. These operate at approximately 45/50 minute intervals until 23-30. There is also a ferry back from Peng Chau at 3-40am. Services mostly alternate between "ordinary" ferries and "fast" catamaran ferries. The journey takes about 25/30 minutes by Fast Ferry and 40 minutes by Ordinary Ferry. 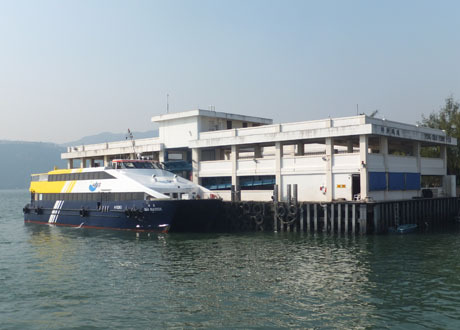 The island is also served by the First Ferry Inter-Island Ferry linking it to Mui Wo and Chi Ma Wan on Lantau and to Cheung Chau at approximately two hourly intervals and kaido ferry services link the island to Nim Shue Wan at Discovery Bay, the Trappist Haven Monastery and Mui Wo on Lantau. There are no cars on the island, just bicycles and small motorised carts. 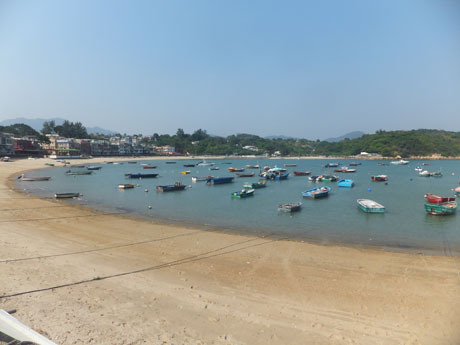 It is possible to walk round the whole of Peng Chau in just over one hour which makes the island suitable for a half-day visit or a simply a port of call on an “island hopping” excursion. 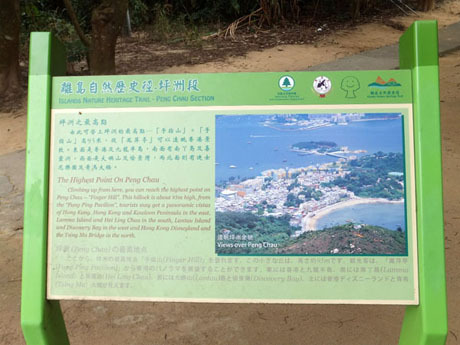 Peng Chau is relatively flat but does have one small peak, Finger Hill with its pavilion and from where there are panoramic views over the island and to Discovery Bay, Disneyland, Lamma, south Hong Kong Island and across the Adamasta Channel towards Cheung Chau. 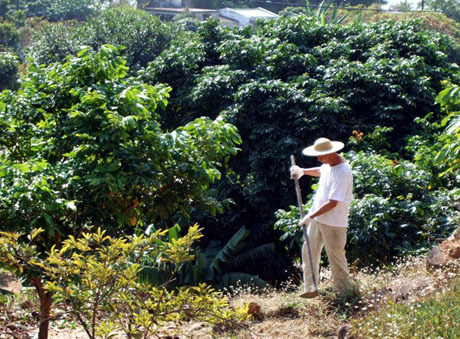 Some parts of the island still have a very rural feel particularly the south-east corner around Nam Wan and Tai Wo which has woodland and organic farms. Close to the pier are narrow shopping streets and a covered market whilst a promenade runs along the south-west side of the coastline. 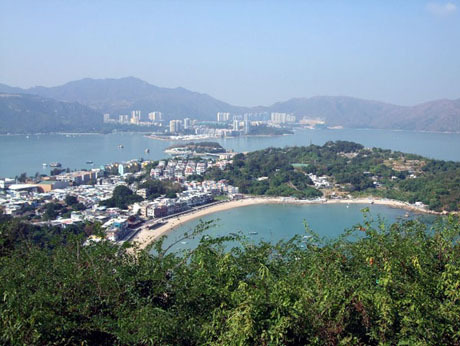 On the north east side of the island is Tung Wan with its pleasant sandy beach. 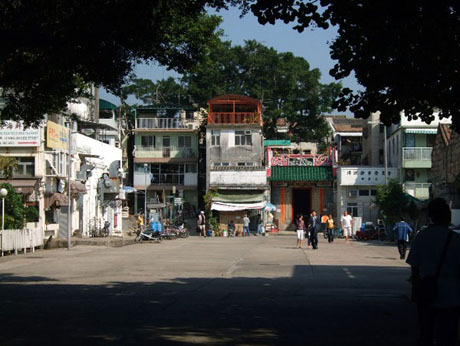 There are three interesting small temples in the centre of the island which can be reached from the ferry pier by following Wing On Street (Peng Chau's oldest street - Wing On means "Peaceful forever) northwards a short distance from Wellcome Supermarket. 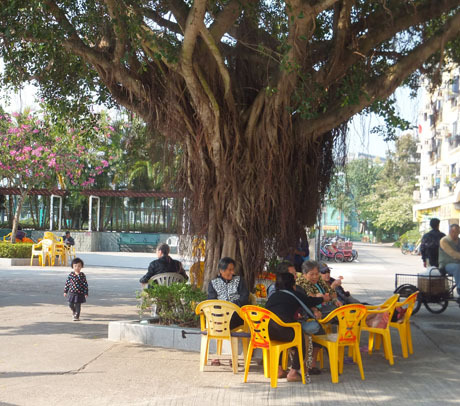 Kam Fa (Golden Flower Mother) Temple, under a banyan tree, honours the goddess Kim Fa, who is said to have learned martial arts from her father and robbed from the rich to give to the poor. 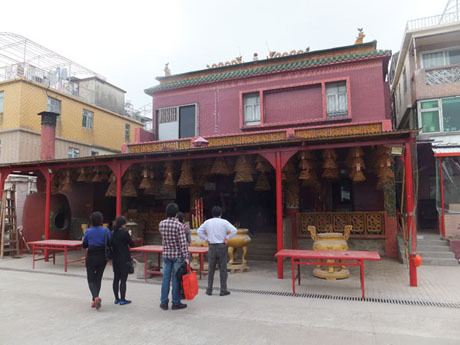 The temple was built over 200 years ago but was neglected and became delapidated until being restored in 1978 and each year since the Kam Fa Festival has been held there on the 17th day of the fourth month of the Lunar Calendar. 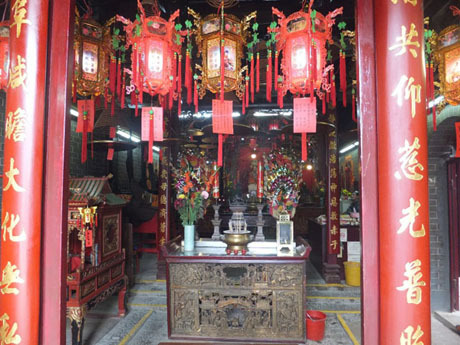 The age of the Tin Hau Temple, dedicated to the goddess of the sea, is unkonwn but whalebones inside the temple have been dated and evidence appears to date the temple back at least 400 years old. An ancient bell inside the temple was made in 1792, six years before the temple was rebuilt in 1798. A parade is held every year on the 21st day of the seventh month of the Lunar Calendar, the day on which the Tin Hau Goddess is said to have cured an epedemic on the island. 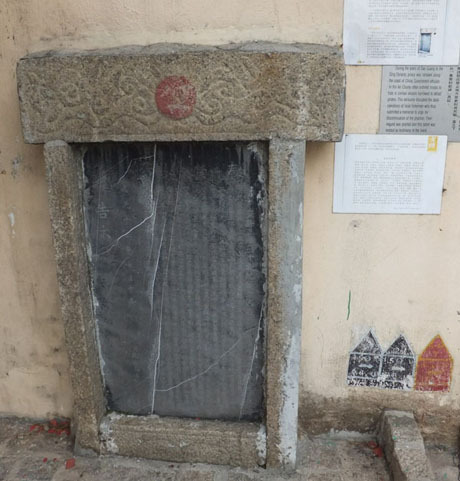 Outside the Tin Hau Temple the faded inscription on this stone tablet erected in 1835 during the Qing Dynasty announces a ban on the expropriation of fishing vessels. The livelihood of local fishermen had been seriously affected by the administration requisitioning fishing boats to lure pirates who terrorised local waters. 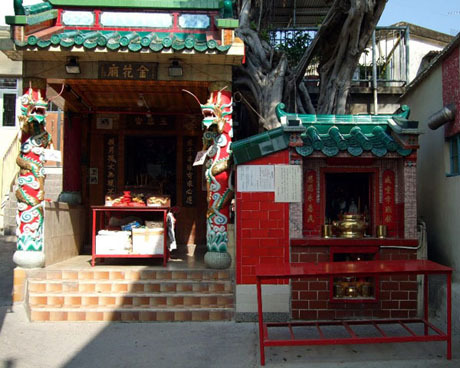 The Lung Mo (or Dragon Mother) Temple, alongside Tung Wan Beach, commemorates a Qin Dynasty woman said to have good looks and great intelligence, who one day whilst fishing picked up a stone which later split open and revealed five snake-like lizards which disappeared and after five years reappeared covered in scales in five colours and stripes. The five adult dragons accompanied Lung Mo from then on and the monarch of the day, regarding this an auspicious sign sent an envoy with gifts to bring Lung Mo to the palace to meet the Emperor. Lung Mo refused but was forced by the envoy to board his ship. On the journey five dragons suddenly appeared and returned the ship to its starting point. This was repeated several times until the envoy, being so impressed with the loyalty of the dragons, appealed to the Emperor to release Lung Mo, who was eventually allowed to go home. Each year, on the eighth day of the fifth lunar month a temple fair is held in celebration of Lung Mo. Peng Chau was once a hive of industry, hosting over 100 factories including the largest match factory in South-East Asia, the Great China Match Plant, set up by the Shanghai magnate Lau Hung Sang, known as the "King of Matches" in 1939, which occupied almost half the island's area and employed about 2000 people at its peak. The factory operated 24 hours every day of the year and produced matches under the "Kowloon Matches" brand which sold for less than a dollar for a carton of ten boxes and were exported to many parts of the world including Brazil and Pakistan. 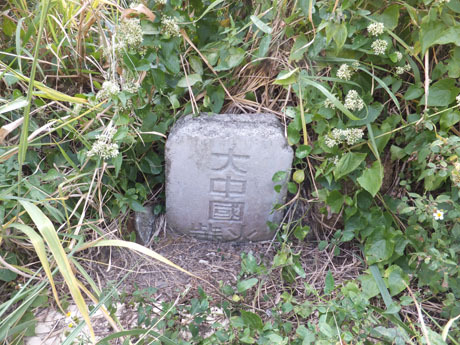 Although the factory was demolished long ago the site at Tai Long Tsuen is still marked by boundary tablets. 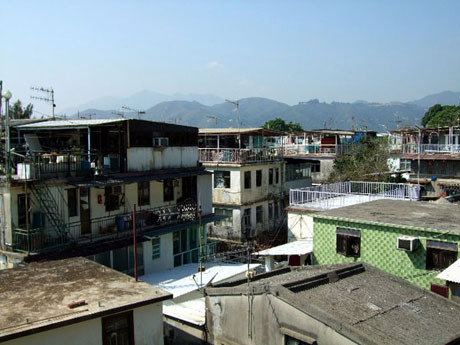 It had originally been planned to build the match factory on Cheung Chau, another outlying island nearby, but strong objections were raised owing to the hazardous nature of the product. Lau Hung Sang also operated Hong Kong's only other match factory, the smaller Hong Kong Matches at To Kwa Wan in Kowloon. Other factories were engaged in the manufacture of teakwood furniture and textiles. After the match factory closed in 1976, following a decline in demand after the advent of the cigarette lighter, the site was taken over by the Hong Kong Teak Company which produced teak wood fittings to many five-star hotels including the Mandarin and Hilton but the factory soon relocated to Tai Po in the New Territories which was more accessible and had better transportation. A calfskin factory, light bulb factory, bowl embellishment works and rattan goods factory opened but all have subsequently closed and no factories at all now remain on the island which has since become something of a rural idyll. Peng Chau's first industry had been lime kilns in the 19th century which saw some 11 factories burning the island's supply of oyster shells, clam shells and coral to produce lime for use in paper and dye production, construction and ship maintenance before the industry went into decline in the 1950's. The Shing Lee (Triumph) Limekiln factory at Nam Wan (South Bay) on Peng Chau is the only surviving site in Hong Kong to be listed as a protected heritage site. The central part of the island is quite densely populated with apartment blocks packed closely together. 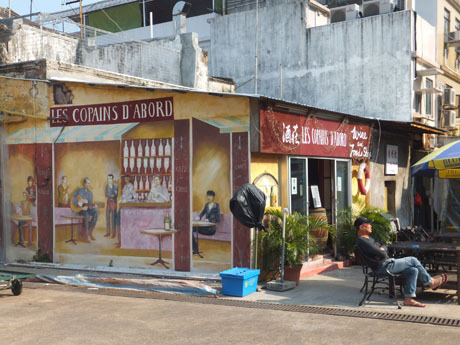 There are a few cafes and seafood restaurants on the island including French bar/cafe, Les Copains D'abord (now closed - December 2015). Snacks and drinks can be obtained from Wellcome Supermarket near the ferry pier.